Dr. Hamarnah is an experienced dentist with a passion for bringing quality, affordable dental care to Central Florida. As the owner of Paradise Dental of Orlando, he is passionate about empowering dental patients to make informed choices about their health. Dr. Hamarnah received his doctorate from Nova Southeastern University's College of Dental Medicine. 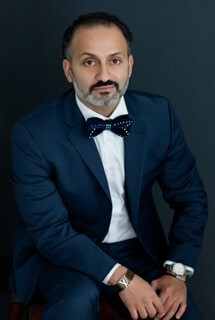 He has over 10 years of experience in dental industry, extensive hours of continuing education in advanced cosmetic and implant dentistry. He has built a successful and well known practice in Orlando, Florida - Paradise Dental of Orlando. He applies the highest ethical and clinical standards to all of his practices. Dr. Hamarnah and his family are longtime Central Florida residents, happy to be a part of the vibrant Orlando dental community.